There is very little doubt that movie celebrities, music icons, and members of royal families can have a significant influence on fashion trends around the world. Sunglasses, handbags, shoe and boot styles, and even clothing patterns and colours have been inspired/swayed by scenes in a major motion picture, a single music video, or photos taken by the paparazzi. Beyond the prompting of fashion trends, many feature films, live concert performances, and photo shoots have also played an influential role in the décor of homes, offices, and lobbies. How? Through furniture styles chosen by the set designers and production designers tasked with creating the background sets, stages, and locations for these performances or events. 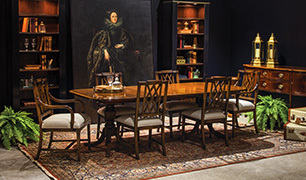 For set designers and production designers of movies, television shows or series, and stage performances in Toronto and Montreal, there is an opportunity to establish the same type of influence with their viewing audiences and beyond as well – through the furniture and prop rentals made available at Carrocel fine furniture. Carrocel offers an exceptional selection of furniture and accessories to help designers and their crews create film and stage sets from essentially any era; the Carrocel artisans can also custom-manufacture furniture pieces to present a particularly challenging, rare, or unique production background. Crews from Toronto, Montreal, or other production locations can gain an appreciation for the scope of Carrocel’s furniture and prop rental inventory by visiting their 20,000 square-foot showroom, located near the Yorkdale Mall in central Toronto, and browsing lifestyle displays ranging from classic vintage to mid-century modern to contemporary styles. 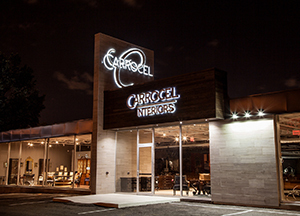 For more information on the collection of furniture pieces, suites, and accessories on display in the Carrocel showroom, please visit our Showroom. To learn more about Carrocel’s furniture and prop rentals for movies, television, and stage, go to our Movie Set & TV Show Furniture Rentals page. Looking for the ideal furniture and props to create the perfect set for your movie, television, or stage production? Call Carrocel fine furniture today at 647-694-4683 or contact us to discuss our furniture rental services.